In his twelfth year as a footballer, Takayuki Suzuki will be playing where no Japanese player has gone before: the professional football league in Serbia and Montenegro. But if anyone is tough enough to deal with it all, it's Suzuki. He had to deal with some pretty tough situations and treatment when he was in Brazil and Belgium (not to mention several bumpy events inside Japan), and he has never let it turn him sour. He's kept his eyes on the ball. 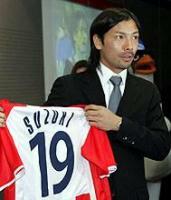 Suzuki has signed a full transfer deal with Red Star -- his first full transfer, after being rented out twelve times. The famed club is populated by many SM internationals, and former J-league Nagoya super-favorite Stoykovic, who is now chairman, has been making a huge effort to make this happen. I hear that the club already prepared a residence and car for Suzuki before he had even flown over. At the press conference held yesterday, Suzuki greeted the press with a few words in Serbian: "Drago　mije．Dobar　dan．　Ja　sam SUZUKI．　Hvala　Sto　ste　dosli！" Today, he is off to Cyprus to join the rest of his new teammates for training before the league resumes on February 18. Due to this transfer, Suzuki will be withdrawing from National Team duties for the next month's schedule. The Japan NT is meeting in Miyazaki for their annual training on Sunday, but I have not heard whether another forward will be called up to take Suzuki's place. I am not familiar at all with the league or with Red Star apart from their resume/history, but I will try my best to keep up with his situation over there. I wish the best for him. Suzuki's three salient characteristics are 1) he's left-footed 2) he's not afraid of the physical 3) he's able to contribute defensively while being in an attacking position (forward). There is some chatter that Red Star may be looking at him to play as a midfielder on the left to take advantage of these qualities. Suzuki is one of those players who is willing to do what is asked of him and doesn't seem to be the type to get hung up on which position he plays, so it shouldn't be a problem with his motivation if they do decide to use him as a midfielder. However, changing positions to midfield may affect his chances on the national team. Or, it could be an interesting turning point for his footballing career. When asked about the risks involved in going to a new league/club with only five months to go until the World Cup, Suzuki said that he isn't one to make decisions now on what may or may not be half a year away. I think at his age (29) and with his experience, it makes good sense. Other players may have the luxury or the scruples to be skittish about transferring now, but in Suzuki's case I don't think it should be part of the equation. This World Cup there is an award that goes to Best Young Player. Fifa has come out with a list of those qualified players (under 20 years of age) they believe have the chance at getting this award at the end of the tournament this summer. Of course, that means he has to get ON the national team bench first... and from the way Zico has responded to nudging from the press about the possibility, we should not hold our breath. Not that Zico has anything against Hirayama. Zico is extremely pleased with the way Hirayama has been performing this season and is following his performances. But he is also very careful about the way in which he calls up new players -- and especially players who have recently caught a wave and are on the upswing. Timing of the callup, the balance of the player's strengths and weaknesses when set among all the other players. It was the same philosophy that kept him from calling up Masashi Oguro in 2004 when Oguro had his most successful year. I think he wants to make sure he gets an idea of the consistency of the player's basic performance. His other concern is also of not tossing players in and out like disposable tissues. Though people are split on their feelings about whether Hirayama deserves to get a call up now or not, this little bit of media attention is exactly what the award publicity people were hoping for. They admit that though Hirayama is the only player in their list of award winner possibles who has yet to make it to the A squad, they feel he has what it takes to play in the World Cup. They say that they hope by shining the light on him, it will re-energize his motivation and perhaps lead to him getting called up. If he does, Hirayama would be an easy one to spot -- standing 190 cm tall in a team that averages in the 170s. He is certainly one player that would be strategically easy to predict. The NT is in dire need of goal-getters now, but Zico may feel he is still too green and is careful about psycholocially damaging Hirayama if he is used before he is ready. In each of the past two World Cups that Japan has played in, a bomb was dropped during the announcement of the WC squad. In France 98, Kazu Miura was dropped. In Japan/Korea 02, Shunsuke Nakamura was dropped. Maybe in Germany 06, we will see a surprise inclusion, not exclusion... and maybe it will be the young Sota. Hirayama just this week got selected into the weekly Best Eleven as determined by Telegraf and Weekly Football International -- a first. Sota Hirayama scored yet another goal -- his 7th of the season so far. A cross from the right met perfectly with Hirayama's head as he sailed towards the goal. The ball scraping past the goalie's fingers to goal right. Hirayama was unable to score during his last game against AZ, ending his three gamae streak. He commented that playing a top team like AZ he may have gotten too tense and was unable to play naturally. Heracles has a very simple strategy when it comes to their attack, given their relative strength in the league, but perhaps because of that they have been able to utilize Hirayama's height and strength in the air and post plays effectively. And because of the simplicity of their aims, Hirayama knows when and where to expect the ball. In this game against RBC, he said that he was able to play more naturally and relaxed. However, he was subbed out of the game in the second half after colliding with the opponent, and after he began to lose the ball frequently. Things are not completely peachy for the the youngster. Now that he's had time to settle in at the club, he may have gotten a little too comfortable with his situation. Recently, he was reprimanded by the coaching staff and captain Hoogma for his lack of full effort during training. When he first went to the Netherlands, it was all he could do to keep up with the training pace and the players around him. But now that he's gotten used to all that, he has admitted that the coaches were correct in getting angry, and that he will put 100% into the practices. I thought Shunsuke Nakamura would be rested for this one following his absences from practice this past week due to a virus. Despite his fever and stuffed nose, he did show up for the final practice ahead of the game, even saying that it was refreshing to be out and practicing. Masashi Oguro had his home debut this weekend. 16 minutes into the second half, he appeared in front of the Grenoble crowd and gave enough of a promising performance to inspire an "Oguro" chant from the spectators. Though the manager was clearly disappointed that Oguro has yet to score a goal, he commented that Oguro played effectively and with speed, demanding into the game with aggressiveness, bringing hope to the supporters. There was one instance where the former Gamba goalgetter found himself face to face with the goalie, but linesmen called him offsides. Unfortunately, his name made it to the match report not for a goal, but for his first yellow card after sliding and tackling the opponent... Last season in the J1, Oguro did not receive one caution. Yoshito Okubo scored his first goal of the season. Mallorca was down 2-0 at halftime, but six minutes after returning to the pitch, Okubo created the momentum for the draw by (finally) finding the net. 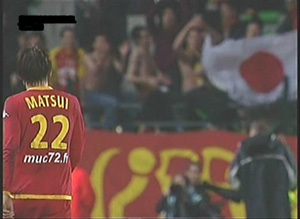 Shunsuke Nakamura scored a goal off a free kick in the opening minutes of the game. The FK spot was begging for Nakamura's left foot, and Shunsuke sent a fairly paced shot over the wall to the right of goal. It's strange to revisit the second division again... reminds me of last year when I was following Daisuke Matsui in Le Mans. Anyway, as you know Masashi Oguro had his first press conference over there last week, and wasn't supposed to play until about the 20th due to his fitness and also his ankle sprain. But last minute issues in the team had the manager suddenly placing Oguro on the bench. Oguro had only had one practice game session with the team before, so I did not expect him to play (or if he did, play only a few minutes). But Grenoble, which is currently having problems finding goals and finishing properly, was having the same problems against Laval on Saturday. Time and time again, they created chances but could not score. A frustrated manager Goudet sent Oguro in at the 65th minute. Oguro looked pretty sharp, but there were problems with lack of communcation and combination, and no goal was scored. Because Grenoble has been having trouble with scoring, there seems to be a lot of expectation about Oguro and his ability to bring more goals to the team. If he takes too much time until scoring his first goal, the supporters may get harsh and turn on him, but Oguro seems to be taking an active interest in speaking French and English and building good relations with his teammates. Hopefully he will be able to connect better with his team in the next game. If he can at least find a Futagawa replacement at Grenoble it could do wonders for his goal scoring probability. Futagawa, as some of you may remember, was Oguro's set-up man through the 2004 season (the year Oguro scored the second most goals in the J1 with 20 goals). Now we are delving into the murky but entertaining waters of gossip and rumors. Thanks to the local sports papers, there is always plenty of fat on which to chew. Now that they have let Shinji Ono go, there is some talk that Feyenoord may be eyeing Urawa Reds midfielder Makoto Hasebe, 21 yrs old. The actual transfer period they are looking at would be the summer, after the World Cup. Hasebe, as you know, just got his first National Team call up, and many football experts in Japan think he has the potential to be one of the NT regulars of the next generation. Hasebe has the advantage of being young as well as attractive marketing-wise. Personally I would prefer he go to another league, and perhaps he will get other offers this year. It's been interesting watching how we in Japan have taken in this sudden news of Shinji Ono's return to the J league. The best way I can describe it is Disappointed Excitement. I think many had wanted to see him go to a new club in a new league in Europe, but there is also an air of anticipation at the prospect of seeing him in Japan again. The irony of course was that Ono was left out of the NT call up list for the Jan/Feb camp and game against the United States because he was in Europe. And the first thing I thought upon hearing he was returning to Japan was "yay, he can join the NT training and go to the US game". But Urawa Reds want him to stay at the club and train with the team in preparation for the season. Urawa play the opening game against Gamba on March 4. It's been four and a half years since Ono last played in the J. Urawa apparently are grudgingly saying they would not put up a stink about Ono going to the US game, but they want him to at least miss the NT training camp that will take place in Miyazaki. Urawa will be without their three NT players, Santos, Tsuboi and Hasebe. I also hear that EPL club Middlesbrough had put out interested feelers for Urawa Reds and NT left side Alessandro Santos, but Santos had said he was not interested. His main reason being that he would prefer to stay in Japan and maintain his condition and play level ahead of the World Cup. Middlesbrough had apparently wanted him to come to England and train with them as a test and see the club. As some of you may remember, Santos was supposed to go over to the EPL (I think there was offers from Fulham and Crystal Palace) a couple years ago. But he failed to clear the requirements of the EPL with regard to foreign players -- namely that of playing a certain number of games with the national team. Kashima Antlers may be hoping to sweep in to "rescue" two ex-Antlers currently not-playing in Europe, Atsushi Yanagisawa and Koji Nakata. Yanagisawa continues to fall off the roster for every game; it's gotten to the point where if he plays five minutes of the game it's alot. Koji is currently playing with Marseille's Youth, completely out of the manager's sight and mind. I believe he has passed on the option of going to Israel. Kashima of course, would want them back at their club rather than being put out to pasture. Whether they can come up with a workable plan, I don't know. There was also some mention of Serie A's Lecce going into the final rounds of negotiation with FC Tokyo over midfielder Yasuyuki Konno. I haven't heard much about this, but it is a possibility. Konno is a shy but very hard-working "keep your eye on the task" player, and I think going abroad would be great for toughening him up while taking advantage of his work ethic. He has avoided making any comments about this rumor, so we shall see if it turns out to be a no-go. I will address all the main J-league transfer news in the coming week, en masse, after most of the moving around has been completed. Despite some news like >>this in recent weeks, Shinji Ono leaked on his >>website that he will be headed back for Urawa Reds. I have mixed feelings about this, but given his short term targets (ie. getting lots of play time, getting on the World Cup squad, and creating cohesive plays with NT teammates on the pitch) this may turn out to be a good thing. Not only will he become part of the "domestic" group (which is extremely weird to think of him) and have the chance to play consistently at Urawa, but he will also have more opportunity to play with the National side. At Feyenoord, at least, he's pretty much plateaued -- actually, he never really found the kind of dramatic improvements people like Shunsuke Nakamura or Daisuke Matsui have had abroad. Whether that was because his environment at Feye didn't force him to, or whether he didn't allow himself to change, etc., or whether he could not, I'm not sure. Ono's speed or toughness has not really improved to the degree I was hoping. At least from what I have seen of Feye games over the past years on tv. And last year he missed a lot of games due to his various injuries and thus missed out on valuable time on the NT as well. But his time abroad did give him a kind larger than normal presence. It will be truly amazing to have a personality like his back in the J-league. I was just moaning to a friend that we just don't have the kind of influential Personality in the J right now -- people like Miura, Ramos, etc., used to be in their golden days. I know that Ono has an especially appealing effect/influence on younger players, and that could be a really valuable thing for Reds and the league in general. I wish only good things for him this year. Sota Hirayama scored the winning goal in the second half of the game. A through pass allowed for a cross from the right that met Hirayama on the far. He dropped the ball with his chest and met the second bounce with an angled shot off his right foot. Nice finish and result for the team, and a good finish from Sota to keep him on the starting eleven. Unfortunately, it will not be a triple crown year for the Bhoys. Their game against semi-pro (or may as well be) Clyde ended with an astonishing loss for the league frontrunners. Bad pitch conditions and an opponent who ran Celtic ragged kept Shunsuke Nakamura and his teammates off their game. Though Celtic have been priding themselves on playing their style of football this season, keeping the ball low and playing with possession, it was not in effect this game. Because of way the opponent played and the bad turf, it may have been wiser to play more of an aerial game. Anyway, it is a disappointment that they could not come through with the dramatic last-minute performances of their previous two games. Nakamura's website message after the Hearts game last week (rough translation): "This week was against Hearts. Usually even in away games, there are Celtic supporters throughout the stadium; but this time it looked like they were confined to the area behind the goal. We were surrounded by Hearts supporters, and it reminded me of the Seria A games. I think the referee was also a bit overwhelmed by the atmosphere. As for the game, we allowed two goals early in the first half. We still had a lot of time left, so even down by two we could play without losing our heads. Though the first half ended 0-2, there was not one player on our team that went to the lockerooms looking deflated. During halftime, we told each other to speed up the timing of our movement, and increase the rhythm of our passing. We didn't lose our focus during halftime, and the second half was controlled by Celtic. First Pearson got us a goal very early in the 2nd half, so we were then down by only 1. And then from there, we couldn't quite find the goal, but we kept our patience and I think that was what won it for us at the end of the day. One of the opponent defenders got sent off, and after that our manager changed our system from 4-4-2 to 4-3-3. This worked perfectly. And in the end of the second half, we were able to come back with two goals off set pieces and win. Actually, the practice session the day before the game, we added 30 minutes to our usual session and reconfirmed our set-pieces. So I was especially happy that something that we practiced brought good results during the actual game. This win allows us a 7 point difference with 2nd place Hearts, but I hope to continue to perform with the team looking at only the game directly in front of us, one game at a time." Daisuke Matsui started for the fifth and sixth games in a row. Against Metz, he sent a vertical pass up the left side which was crossed and headed in by his teammates for one of the goals. Le Mans are currently in 12th place (ie. last place). Allez, Le Mans!! Le Mans' hopes at the Coupe de France were also dashed when they were defeated 1-0 by Lens. Masashi Oguro made his first attempt en francais this week when he greeted the media at his press conference at Grenoble. He introduced himself, with his nickname "Oguri", and said that his only aim was to score goals. Things will no doubt be difficult for him in the coming months -- getting used the way the team plays, communicating in French, etc. He is also still recovering from his ankle sprain, but reports say he should be good to go in a week. Westham have announced that they will not pursue a contract with Kashima midfielder Mitsuo Ogasawara. Oga was at Westham this week, training with the team and getting checked out by the club, but I guess he did not show the kind of presence Westham was looking for. Still, it was a really good experience for him I think -- he tends to be a bit coddled in Japan. Kashima Antlers admitted that they received a fax from Crvena Zvezda Beograd (Red Star Belgrade) this week regarding their interest in acquiring NT forward Takayuki Suzuki. Suzuki has been struggling at Kashima and on the NT of late, and Kashima said that they would first ask Suzuki how he felt about the possibility of his move to the famed Serbia Montenegro club. Suzuki is not unused to moving around -- and my guess is that if there are not personal life issues hindering his decision he would be likely to take the offer. I just want him to "find himself" again... And if Red Star appreciates what he has to offer and gives him a decent amount of playing time it would be a worthwhile challenge for him. Nothing developing with regard to possible transfers for Shinji Ono or Naohiro Takahara... There was some talk that Bundesliga's Frankfurt may have been interested in Taka, but basically nothing really concrete. If you can believe it, Celtic were down 0-2 at halftime. But this was the big game in the SPL this week, the meeting of the top two clubs. And on New Year's day, no less. Celtic have not had a clean sheet since...I can't remember, something like 7-8 games? And though one could grumble about this and that, the comeback drama blew all that away emotionally. It was psychologically a big win. Shunsuke Nakamura did not show the same kind of flashes of brilliance consistently through the game, but he was instrumental in the second and third goals -- which came from Nakamura's free kicks. There was also a wonderful no-goal earlier on in the game when some beautiful one touch fluid passing involving Shunsuke up the right allowed him a good mid-range shot that was stopped just by the goalie. Though a teammate took a shot off the uncaught ball, it hit the post, and then it was picked up by I think Maloney for a goal; but the linesman called an offsides (which upon video inspection we found it wasn't, but it was a difficult call with the naked eye). Shinji Ono made his season debut by coming on at the start of the second half. He got a warm round of applause all around, and looked to be having a tremendously fun time. He even took a few long-range shots and brought his own vision to the midfield. Sota Hirayama started for the third game in a row, and got MOM for getting one goal and assisting the other two. His goal was a very high quality header off a cross from the left, which he directed to the right of goal. It was his fifth goal of the season. He was not at full form, having some problems with his leg (and still seems to be troubled by the infection near his ear), and the snow really piled on towards the last portion of the game -- the manager pulled him out early, but he still made a very big impact. A nice way to end the year for the 20 year old, and right in front of his visiting family too. MF Yasuyuki Konno, 22 (FC Tokyo): there is some talk that he may be going to Serie A club Lecce. Lecce have been teasing several J-league players in 2005 with some talk of transfer, but nothing had come of it, so I'm not sure how much to believe this. MF Mitsuo Ogasawara, 26 (Kashima Antlers): Will be on a plane for Italy tomorrow, for a test training session with EPL club Westham. He will be there for about a week, after which he will return to Japan and join the National Team for their January 29 training camp. FW Tatsuya Tanaka, 23 (Urawa Reds): There is some rumor that Serie A's Reggina (where Shunsuke Nakamura used to play) is interested in finding a Japanese player, and Tanaka or Yanagisawa may be on the list. This is really really unreliable rumor, but I thought it was kind of good to see Tanaka's name connected to a Euro transfer. Koji Nakata, who has been more or less tossed aside by Marseille's manager, said on his website that we would likely hear of his transfer in January. Fingers crossed. I usually drop by the bookstores one or two times a week to browse the magazines. I have a day off tomorrow, and will probably stroll over to the shop and purchase this issue of Weekly Soccer Magazine (Shukan Sakkah Magajin). 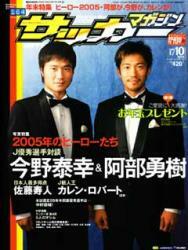 The main contents include an interview with Yuki Abe and Teruyuki Konno together (they chat at each other as well as answer the interviewer's questions), and features on Hisato Sato, Robert Cullen, Makoto Hasebe, an interview with now ex-Kashima manager Toninho Cerezo, an article on Ivica Osim through the eyes of his coaching staff, and more. I will share any juicy bits if I find anything interesting. This issue also announces the magazine's Annual Crystal Award goes to Shunsuke Nakamura, and takes a look at his performance this year. Speaking of Nakamura, he has posted a message following the Livingston game (where he got the last minute goal) >>click to read previous entry. "It was a really cold day, and I made sure to focus on my warm up prior to the game. However because of power failure, the game was delayed almost an hour and I had to re-warm-up again. I think this delay slightly threw our rhythm off. Not just for the players, but it seemed also among the supporters too. The atmosphere was a little different than normal. Regarding the game, we were able to go ahead with a PK, but were not able to pull the momentum our way. And when we entered the second half, the team as a whole was not moving, and we allowed the opponent the equalizer. That goal allowance was the fault/responsibility of every member of our team. We allowed ourselves to lose focus for too much of the second half. The remaining time was running out, and the team started to rush things a little, but Telfer was different. Under these circumstances, a player would be tempted to haul in long balls, but Telfer sent me a pass with the exact timing I wanted it. I got around one defender and took the shot. When the ball went into the goal, I was really happy. It was physically and psychologically a tough match. Next round is away at Hearts, who are in second place. Hearts have not lost a game at home yet. It will be a difficult game, but I will make the effort to move and play in such a way to be able to contribute to the team's victory." The blackout and the ungranted PK aside, happy news from this nerve-wrecking game. 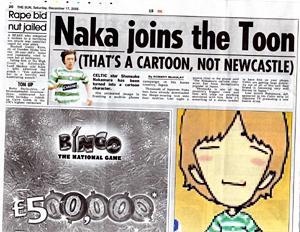 Shunsuke Nakamura scored his 3rd goal of the season. Quite dramatic actually, as it was something like 88 minutes and the score was 1-1 at the time. Nope, this was not a free kick -- it was a very nice dribbling effort completed by a fast low shot. Pretty sweet. It's so good to hear. Was reported that Shinji Ono was on the bench in this weekend's Feyenoord game against AZ. Feye won 2-0, and Ono did not play, but it is a big step to him returning from his injury. It's been 3 months! Ok, Shinji, no - more - injuries ...! Gamba Osaka's Masashi Oguro announced it's official. Sayonara will become Bonjour -- his transfer to France's Grenoble is set. He visited the Gamba clubhouse to say thanks and farewell, and reports say he was bawling. Oguro is a Gamba Boy through and through; the club has been involved in his life since Oguro was six years old, so it must be like leaving a true family. Messina forward Atsushi Yanagisawa might be coming back to the J. We all know how little play time he is getting in Italy, but the team loves to keep him. They don't want to let him go -- at least, they don't want to let their Japanese player go. I heard a rumor that Yanagisawa has said he wants to come back to the Jleague, to Kashima Antlers. Messina is okay with that, only if they get another Japanese player in exchange... Right now the guy at Kashima most wanting to go abroad is Mitsuo Ogasawara, so that exchange may happen. I still think Messina's posture regarding Japanese players is creepy, and I'd prefer Ogasawara to go to a club that actually wants him for himself. But I think Serie A may be a good place for him to build his streetsmarts (like Nakamura did), getting used to rougher player and quicker thinking. Junichi Inamoto, who has been playing full matches for about 7-8 games now had to sit this last game against ManU out due to injury/strain of his thigh. From what I have heard he has been playing at 120% this past couple months, and I had been worried about an injury...hopefully he is ok. The Scottish Sun's December 17th issue wrote a blurb about Comic Shunsuke, a little 4-square comic strip that is presented in the Pocket Shunsuke services available as a cellphone feature for fans in Japan. Registered members can access via their phones, and get a more personal Shunsuke experience... The comic character is also joined by a band of "superheroes" called Spo-Rangers (the Spo is a shortened expression of "sports"). The comic character is kinda cute, ain't he? Anyway, the cellphone service (which I don't subscribe to) also includes frequent voice messages from the Celtic midfielder, with topics ranging from Celtic and JapanNT game content to more private comments about things going on in his personal life (though to be honest, Shunsuke is such a private person, I don't think he says anything that is exceptionally revealing). If you live in Japan, you can access and register via Nakamura's website >>Click to go to website. "This game against Inverness was particularly significant in our bid to widen the points between Celtic and the second place Hearts (who lost to Rangers in the same round). Just after the starting whistle blew, we gave up a rather unlucky goal, but with Hartson's goal we were able to even the score by halftime. The second half was a difficult game for Celtic; we couldn't get the needed goal. Inverness's strategy was to defend well first and aim for a counter. We were well defended against, and we could not find a way in, lacking in offensive options. It felt like were just passing the ball around. We fell into the trap of the opponent's strategy. Inverness played an ideal game for a team in their position (being lower in the ranks). The result was a draw, but the content was Inverness's win. I don't think we have to change the definition of our style/play, but we do need to improve the quality of each individual play. The next round is our last of the year, and the one after an important encounter with Hearts awaits. I want us to get the victories along with good content."